X-Rap® 10- This lure can work virtually anytime of the year, including the dead of winter where bass suspend along steep, vertical banks. Or it can be effective over submerged grassbeds in relatively shallow water. The X-Rap’s erratic, slashing action is second to none and makes it my preferred lure whenever fish (any gamefish - fresh or salt) are scattered or inactive. Original Floater®- This is my all-time favorite for catching fish along bare banks or around sparse cover. In clearer water, it’s like a magnet for cruising fish. When the bite gets really tough, I throw this lure on a spinning outfit with 8 to 10 pound line, making long casts so as not to spook the fish. It’s bailed me out of some really tough tournaments and nearly won a Bass event on Lake Okeechobee for me! To me, the Original Floating Minnow represents the purest form of artificial minnow - it’s a legendary design. DT®06- This is my favorite medium-running crankbait. In 2004, I tied it on for the Bass opener in Florida and never took it off the entire season. It produced great catches of bass for me throughout the season, in all kinds of conditions, on a wide variety of lakes and rivers. It’s my absolute go-to crankbait. The colors I prefer include: red crawfish (cooler months) and blue-chartreuse (warmer months). I crank it along sloping 45-degree banks, riprap, through shallow ditches, around docks, laydowns, cypress trees, and especially where rock is mixed with brush. A steady pace retrieve is all that’s needed. Skitter Walk® - Anytime fish school, I want a Skitter Walk rigged and ready. It casts like a rocket and its deep resonating “knocker” really calls fish from a distance. I’ve seen both smallmouth and largemouth swim up from 20 feet of water to crush this lure. Besides bass, I use it on the flats in saltwater for tarpon, snook, trout, and reds. Its success is well documented throughout the coastal waters of my home state (Florida). It walks better than any lure in its class. On reservoirs and water clarity and comfortable temperatures, bass usually respond aggressively to the walking action of this lure. If I’m fishing it over submerged cover, I always try stalling the bait directly over key objects, then restarting the walking action this can be a killer method for pulling big fish out of stumps, brushpiles, or from holes in submerged grass. Shad Rap® - This lure works when nothing else will. When fishing is tough, I tie it on to a medium-action cranking rod and start running the bank. If there’s a fish around, chances are good it will bite a Shad Rap. It’s been my experience that this lure excels when small shad are the primary forage in any given body of water. I’ve made it work around docks, along rocky 45 degree banks, and even over submerged weedbeds. It’s a truly versatile lure, so long as there’s some type of similar forage it can mimic. Have to include the X-Rap® SubWalk™ - This is the most exciting new lure design since the X-Rap. I’ve had success fishing it both in fresh and saltwater. If you know how to walk-the-dog with a topwater lure, you can easily fish this subsurface lure. 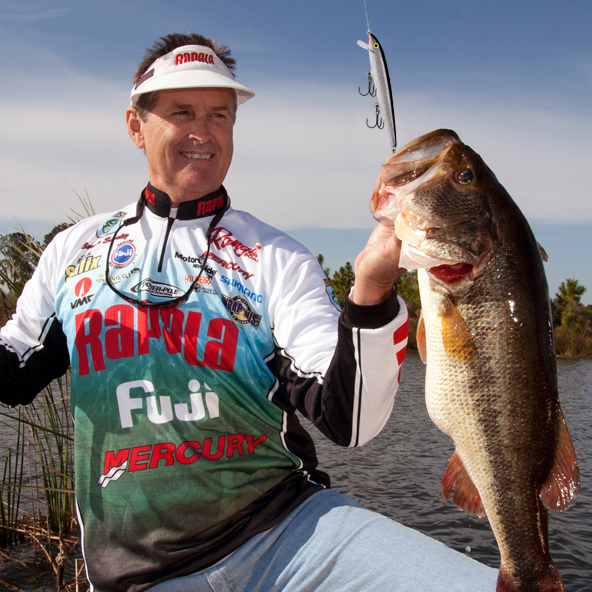 It works well for saltwater species in skinny water situations like those found on coastal flats and it can also draw bass and stripers from the depths of inland reservoirs. It’'s like the ultimate go-between for jerkbaits and topwaters. It catches fish when they are reluctant to travel all the way to the surface and the strikes are deliberate and vicious. My best success has been over submerged weedbeds in warmer conditions. That’s when this lure seems to shine. DT® Fat- I’ve waited on this lure for years - and believe me, it was well worth the wait! The DT Fat is a shallow-water angler’s dream. With its wide profile and exaggerated wobble, the DT Fat can plow through the thickest cover imaginable, including stumps, flooded brush, and laydown trees. The DT Fat deflects off hard cover almost as well as a spinnerbait. I throw it on heavy line (17 - 20 pound test) into places where fish never see a crankbait. When water becomes stained or off-color, bass will position themselves in shallower cover, particularly wooden cover. That’s when this lure will shine. Throw it just like you would a spinnerbait and bang it against as many branches or twigs possible. It will blow your mind what you can get a way with using the DT Fat. I guess it would have to be the Shad Rap®. Whether I'm fishing a natural lake or an impoundment, the Shad Rap seems to catch fish when other lures fail. So long as there is reasonable water clarity, this tight-wiggling lure can entice fish that would otherwise pass up the offering. It's also a good wintertime lure, when bass are slow to react to most lures. There's something about its swimming action that makes it one of the most reliable crankbaits made. There's not a pro on tour that would be caught without one! Lake Ontario (northern lake) and Lake Okeechobee (southern lake). Watching my 10 year old son catch his first permit on the flats in the Florida Keys. It was a true battle - one where the fish was winning until the very end. My wife also witnessed the event and we talk about it to this day.